I might be biased about this tutorial because she uses the exact same high chair that we have but I think a lot of people spend more money when buying a brand new highchair not because they think its safer or sturdier but because it looks prettier or matches their tastes better. 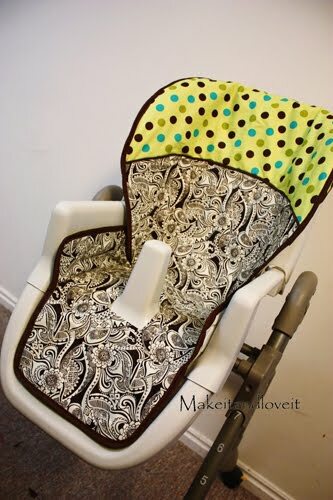 Make it and Love it has come up with a great tutorial for those people who need a new look for their worn out or drab high chair. After all, it is as much a piece of furniture as your dining chairs! In fact, you could make one to MATCH your dining chairs! Oh the possibilities are endless. If you want to use an oilcloth instead of absorbable fabric check out these sellers for some patterns that pop. Ok, I need to do that! After Christmas. I have the perfect fabric too. Thanks for posting! I have been glaring at my grotty high chair that is now serving my 3rd child (since last week) and scratching my head as to how to make my cute fabric that I bought for it into a cover. My sunday project has just reared it's head!